A car crash on I-295 near Freeport closed the northbound lanes Saturday morning. 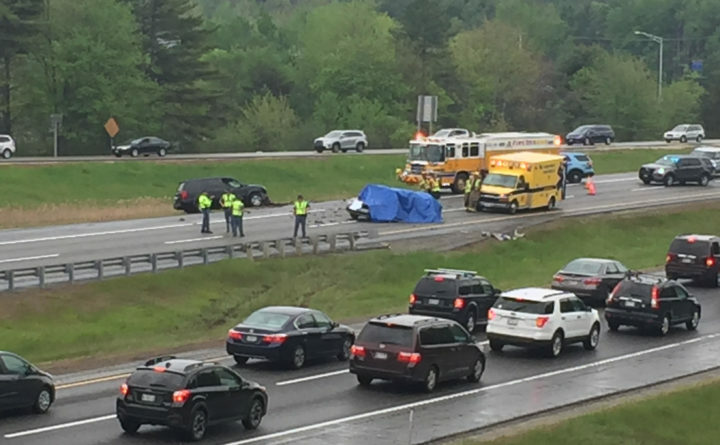 FREEPORT, Maine — A fatal car crash in Freeport closed part of Interstate 295 on Saturday for 3½ hours, forcing traffic headed north for Memorial Day weekend to be diverted to alternate routes. Raymond Bisson, 50, of Gardiner died at the scene, according to Stephen McCausland, spokesman for the Maine Department of Public Safety. It was the first fatal crash in Maine on a Memorial Day weekend since 2014, he said Saturday afternoon. Speed most likely was a factor in the crash, according to troopers on the scene, McCausland said. Bisson was not wearing a seat belt. Bisson first collided with a car in the southbound lane, then crossed the median and his car was struck broadside by a third car, McCausland said Saturday evening in a release. That car was occupied by a family from Connecticut who were taken to Maine Medical Center in Portland with non-life threatening injuries. Injured were the driver, David Pendred, 50, his wife, Laura Pendred, 45, and their 10-year-old son Micheal Pendred, all of East Haven, Connecticut. The driver of the first car, struck in the southbound lane, was 53-year-old Michael Cox, 53, of Durham. He was not injured. Crews responded to the scene near Exit 20 in Freeport shortly before 10 a.m., with Maine State Police diverting traffic between Exits 17 and 20. I-295 in the area of the accident was closed for several hours as troopers worked to reconstruct the accident, McCausland said. Traffic was rerouted onto Route 1, which also was congested, according to a Bangor Daily News reporter who was rerouted due to the crash. The reporter said it had been raining Saturday morning in southern Maine and the roads were wet. BDN reporter Beth Brogan contributed to this report.